I was perusing a website that was all about lists this morning; top 10 wackiest philosopher parties, most common panda birth defects, that kind of thing. It made me think of some of the stupidest things humans have invented or done that have turned out to be pretty nasty for us and the planet. In line with my philosophy to be brief, here are but three that sprang to mind. Well, packaging in general and plastic packaging in particular. Why must electronics and certain household items be wrapped up in so much hard plastic that it takes several different tools and a blinding amount of patience to open? Why do we need individually packaged bits of salt-sodden luncheon meat and cheese food? Coconuts have their own protective covering, they do not need a layer of plastic wrap as well. So much of this stuff can’t or isn’t recycled and merely ends up hogging landfill space. 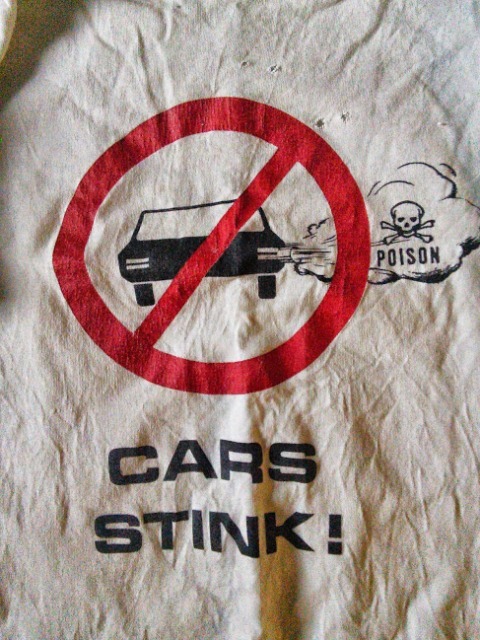 I was wearing this shirt while biking one day; a woman stopped to tell me that she thought I stank. I was a bit gamey that day but since body odour isn’t a greenhouse gas, I didn’t take it personally. In general I find cars to be noisy and smelly and they get in my way. You may not feel the same but you can’t deny that the private automobile has been a problem for us. Combined, emissions from transportation make up one-quarter of Canada’s GHG emissions. Productivity losses from being stuck in traffic costs Canada billions of dollars every year ($5 billion in 2006; some estimates have it as high as $10 billion per year now). The private vehicle is responsible for the rise of the suburb and the satellite community and the ensuing problem of having to provide ever-expanding transit service to outlying areas; a lot of prime land has been paved over just so that cars have somewhere to sit all day; and, at least to a certain extent, being able to drive wherever we want has led to a fattening of North America.